An Australian descendant of his sister Ethel posted a photo of the young Archie on the Ancestry website. The Local Studies Collection at Swindon Central Library has a further two photos viewable on their Flickr website. Archie appears in a team line-up of the 1912-13 Swindon Corinthians Football Club. 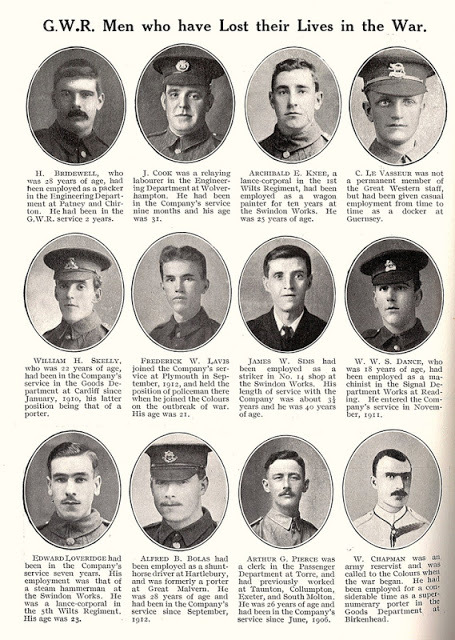 More poignantly, he is also pictured in the September 1916 edition of the Great Western Railway Magazine, among other GWR men who lost their lives in the war that month (shown below). Born in Stroud in 1892, Archibald Edward Knee was one of Francis and Rose Knee’s eight children. He moved to Swindon and a job as a railway carriage painter in the Works, and by the time of the 1901 census, the young family were living at 123 Albion Street. On leaving school, Archie followed his father into the works, no doubt expecting he had a job for life. A 15-year-old boy could hardly have foreseen what was in store for him and his generation of young men. In the spring of 1916 the British army prepared for the ‘big push’ – the allied offensive that would finish the war. But the horror of the Battle of the Somme would see more than 57,000 British soldiers killed, wounded or reported missing during the first 24 hours of action. The 1st Battalion of the Wiltshire Regiment was entrenched at Pylones, three kilometres north of the German-held Vimy Ridge. On May 21 the German army bombarded this section of the Western front, firing everything at their disposal, including gas and lachrymatory shells. The men of D company were fighting by day and making running repairs to fencing and trenches throughout the night. In the trenches. The enemy were able to reach the Birkin Crater post with cylinder stick bombs and some casualties were caused. Many rifle grenades were fired at the outpost line of P73: those fired in retaliation appeared to do considerable damage. After 5pm the enemy fired several heavy trench mortars at P74 and P75 and also at the head of Grange CT. Snipers claimed three Germans. Repairs to the P line were carried out and a large amount of wire was put out along the whole front during the night of 24th/25th. Private F Daniels of ‘A’ Company was killed outright. Casualties that night numbered ten, and among them was 25-year-old Lance Corporal Knee, whose address was now 31 Catherine Street, Swindon. Archie died of his wounds five days later. He was buried in the military cemetery at Etaples. With 10,773 graves, Etaples is the largest cemetery in France to be maintained by the Commonwealth War Graves Commission. Nearly 100 years later Archie continues to be remembered by his family and the town in which he grew up.